"I got a basic recipe for this from a friend many years ago. Since then, I've tweaked it to fit my family's taste. It sounds like a lot of work, but it really isn't. We find that this is one of our favorite recipes." Mix together the ground beef, 1 1/2 teaspoon oregano, 1 tablespoon parsley, and salt in a bowl. While the rice cooks, heat the oil in a skillet over medium heat. Cook 1 minced onion and 1 minced clove in the hot oil until the onion is soft; add to the beef mixture; form into 24 small meatballs. Cook the meatballs in the skillet until evenly browned on all sides; drain. Place the remaining minced onion and minced garlic clove in the skillet; cook and stir until the onion is soft. Stir in the tomato puree, bay leaf, vinegar, 1 teaspoon oregano, 1 tablespoon parsley, chili powder, brown sugar, cumin, salt, and pepper; cook until thick, about 20 minutes. Add the meatballs and cook until the meatballs are no longer pink in the middle, about 10 minutes. When the rice has finished cooking, stir in the corn. 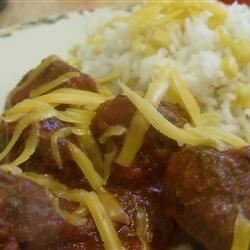 Serve the meatballs and sauce over the rice. I'm sorry to write this. Avoid it at all costs!!! Saved it, made it, we could not eat it. Hubby said it was the worst thing he's tasted from AR. We made this as written.